The biggest and brightest Kapamilya stars descended on truly eXhilarating night as ABS-CBN launched it’s newest programs – Be Careful With My Heart, PHR Isla and Pintados, Kahit Puso’y Masugatan, Little Champ, Lorenzo’s Time, Ina,Kapatid,Anak, Apoy Sa Dagat and A Beautiful Affair plus the biggest musical-reality show on TV, The X-Factor Philippines, will surely change the landscape of Philippine television. All coming very soon on ABS-CBN’s Umaganda, Kapamilya Gold and Primetime Bida. (L-R) Aryana’s Bianca Manalo and Desiree Del Valle, TV Patrol’s Kuya Kim and Gretchen Fullido; Primetime’s two hottest men, Coco Martin and Urian Best Actor Paulo Avelino. (L-R) A rare moment – Dawn Zulueta and KC Concepcion, My Star In A Million boys Christian Bautista and Erik Santos; Carbon Copy – Gabby and KC. (L-R) My forever crush, Mr. Richard Gomez; Lorenzo’s Time’s Ms. Carmina Villaroel, The gorgeous Julia Montes; PBBTeen’s Kit. 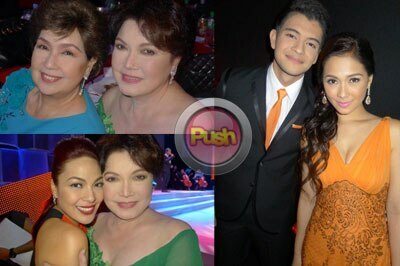 (L-R) Cinema Icons, Ms. Susan Roces and Ms. Helen Gamboa; KC and her Tita Helen ; Rayver Cruz and Urian Best Actress Maja Salvador. (L-R) KC and Luis, showbiz royalties; Lorenzo’s Time’s Zaijian Jaranilla ; Concert King and X-Factor judge Mr. Martin Nievera. (L-R) Ms. Amy Austria; Ms. Gina Pareno ; Ms. Janice De Belen. (L-R) Jodi Sta Maria and Richard Yap of “Be Careful With My Heart”; My new crush, Dominic Roque of Aryana ; Kim and Xian of Ina, Kapatid, Anak. (L-R) Ms. Dawn Zulueta; My new crush, Iza Calzado and Jake Cuenca of Kahit Puso’y Masugatan; Angelito Book 2’s JM De Guzman; The ladies of Walang Hanggan. 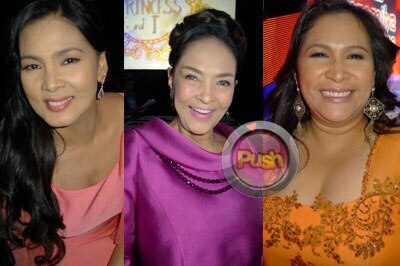 (L-R) Ms. Cherie Pie Picache; Iza Calzado and KC Concepcion; Vice Ganda.